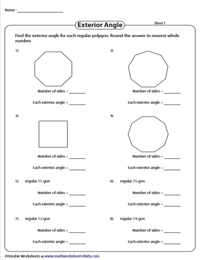 This assemblage of angles in polygons worksheets for high-school students encompasses a multitude of exercises to find the sum of interior angles of both regular and irregular polygons, find the measure of each interior and exterior angle, simplify algebraic expressions to find the angle measure and much more. 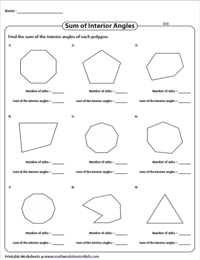 Based on the number of sides used, these worksheets are categorized into easy and moderate levels of difficulty. 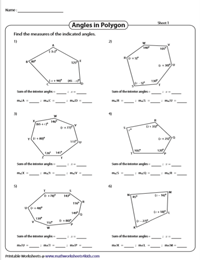 Employ the Regular polygons - Angles chart as a precursor. 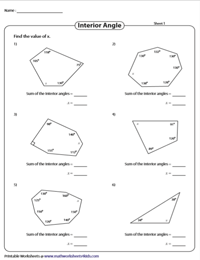 Decompose the regular and irregular polygons presented in these high-school worksheets into individual triangles. Multiply the number of triangles formed with 180 to determine the sum of the interior angles. Each polygon has sides ≤ 10. Substitute the number of sides of the polygons(n) in the formula (n - 2) * 180 to compute the sum of the interior angles of the polygon. This level helps strengthen skills as the number of sides ranges between 3 & 25. 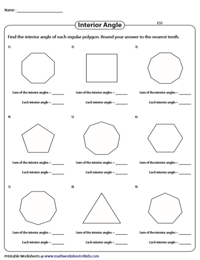 Count the number of sides in each of the polygons featured in this batch of worksheets. Divide the given sum of the interior angles by the number of angles in the polygon to find the size of each interior angle. 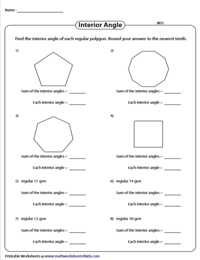 Hone your skills in finding the measure of each individual interior angle with this set of worksheets featuring regular polygons with ≤ 20 sides. The problems are offered as geometrical shapes and in the word format. Add up all the given interior angles in the irregular polygons and subtract it from the given sum of the interior angles to determine the measure of the unknown interior angles in these irregular polygons. The sum of the exterior angles at each vertex of a polygon measures 360o. 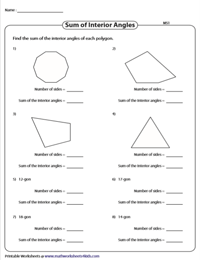 Divide 360 by the number of sides, to figure out the size of each exterior angle in this unit of regular polygons worksheets. Determine the sum of the interior angles using the formula. Set up an equation by adding all the interior angles, presented as numerical and algebraic expressions and solve for x. Plug in the value of x in the algebraic expressions to find the indicated interior angles.